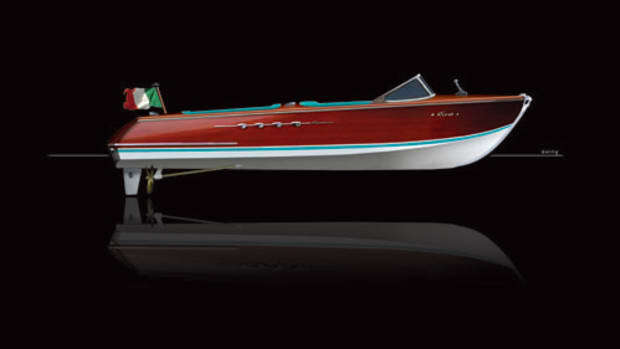 Seven Marine has taken a 376-cubic-inch General Motors engine used in the Cadillac CTS-V and hung it off the transom of an Intrepid 370 Cuddy. In fact, it&apos;s hung two of them. Click play to watch Chris Landry&apos;s interview with the company&apos;s president and vice president. Mobile users can click here. Seven Marine&apos;s 557-hp engine, which weighs 1,000 pounds and has an estimated retail price of $68,900, was the talk of the Miami International Boat Show. The Intrepid that was on display is normally powered by triple 350-hp Yamahas. The twin 557 outboards could push the boat to 80 mph or faster, according to the company. It&apos;s the industry&apos;s first production-built, joystick-controlled outboard boat. Soundings stopped at the Seven Marine and Intrepid booth to chat with the minds behind the new engine. Click play to watch Seven Marine&apos;s explanation of the manufacturing process. Mobile users can click here. Look for more on Seven Marine in a future issue of Soundings magazine.